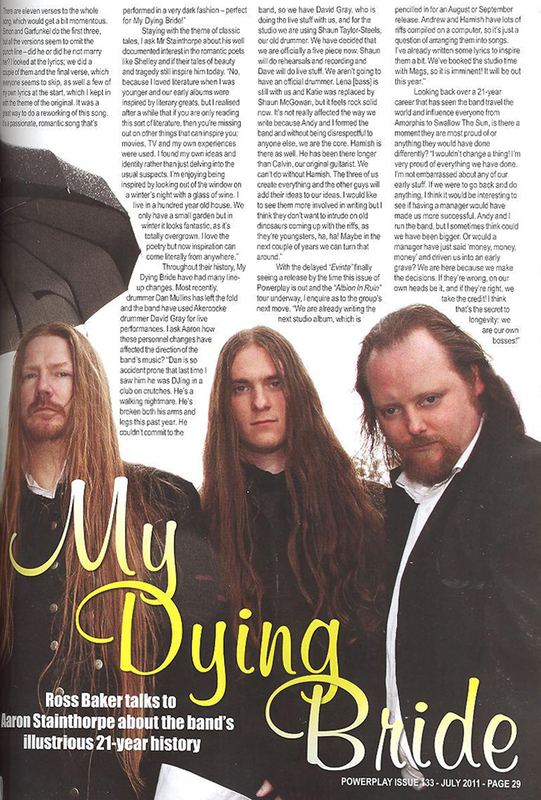 My Dying Bride is generally seen as one of the godfathers of the UK doom/death metal movement in the early nineties.They’re still going strong despite several line-up changes over the years. Recently the band released an EP, containing leftover songs from the A Map of All Our Failures sessions. 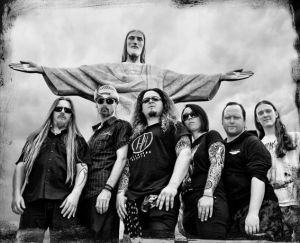 Ghost Cult caught up with singer and frontman Aaron Stainthorpe to discuss the new MDB release, Aaron’s dabblings with poetry and the recent adjustments within the band. The Manuscript E.P. contains the song with a Swedish title ‘Var Gud Over Er’. What inspired this song and why the Swedish title? It means “Our God over Yours” and concerns the vicious attempt by religious fanatics to convert a fictitious town I placed in Scandinavia, to their own beliefs, which as you would expect, goes horribly wrong. It features some very aggressive vocals as befits a bloody battle over which holy path to follow. And the Swedish title lends itself well to the subject matter and also offers a little mystery to non-Swedish speaking folk. Traditionally, My Dying Bride have used many foreign language titles and this adds to that colourful collection. One thing your lyrics succeed in doing is combining aggression with vulnerability. Take ‘The Barghest O’Whitby’ for example. The vicious beast is feared by many but he himself is actually lonely and isolated. What inspires the creation of these great characters? Telling tales is what song writers do and it’s always worth looking at a subject from an unusual angle as it adds something new to the story. There are many beasts in folklore of which all are spoken about from the village’s/humans’ point of view but I decided to create my own script taken from the viewpoint of the dark menace and the emotion it endures which is never normally known. Have you ever considered becoming an author? Maybe you could produce a companion novel to an album in the future? I’m not sure I could write a book but I do enjoy writing short stories and am actually working on putting all my literature into one volume, including all the lyrics for My Dying Bride along with notes and information on song meanings. It’s a project for the future though and won’t come out for a few years yet. How do you decide wither a lyric requires a spoken section, clean singing or growling? It all depends on what the character is enduring. Death metal vocals, because of their aggressive nature, naturally give a heightened sense of anger/revenge & hatred and can be very effective when paired with brutal riffing and pounding drums. And of course, the flip side would be the whispering, which conveys sadness and loneliness but also menace too so can be used to draw the listener down what looks like a safe passage only to cut them off with a burst of unexpected horror. In the last two years you’ve released Evinta, The Barghest O’Whitby, A Map Of All Our Failures and now The Manuscript. What has prompted you to be so prolific as of late? I can’t pinpoint any single reason only to say that we simply have a wealth of idea’s gushing from a cornucopia right now and are even thinking about the next LP which we may even record later in 2013. I feel that when you have the juices of creation babbling up inside you, it’s only natural to let them come forth. Perhaps there is something in the water in Yorkshire that is moving us to compose so frequently. You have former Akercocke and current Voices drummer David Gray working with you for live shows and your old drummer Shaun Taylor-Steels playing with you in the studio. Do you see this arrangement still being manageable with David’s commitments to Voices? David is no longer with us which is a pity as he was not only an accomplished musician but a wonderful bloke. The relationship we had with both drummers worked well for a couple of years but we now have Dan Mullins back with us so that has added stability to the unit once more and we hope to record with the little fucker on the next LP. You and Andrew run the business side of the band. How important has it been for you to manage yourselves and retain that control? It’s very important to us, after all, who know the band best? Sometimes the business side of things can take the shine off the creative side but we’ve leant to deal with that over the years. More bands should manage themselves – it’s fun! What’s next following your festival dates this year? We are poking around with new ideas for new songs and we may even be able to squeeze the recording of the next full length album in this year, but if not, we’ll take our time and it can come together when it’s ready, but we’re busy and that’s just how I like it. 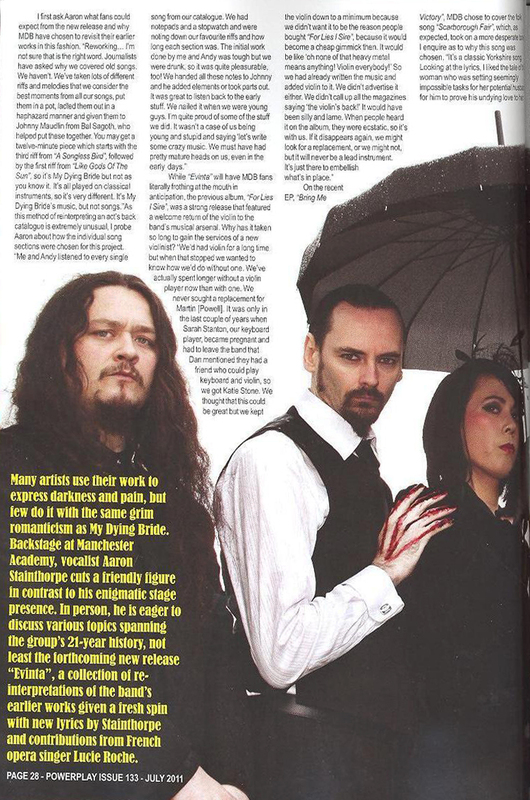 Many artists use their work to express darkness and pain but few do it with the same grim romanticism as My Dying Bride. Backstage at Manchester Academy, vocalist Aaron Stainthorpe cuts a friendly figure in contrast to his enigmatic stage presence. In person, he is eager to discuss various topics spanning the group’s 21 year history, not least the forthcoming new release “Evinta” a collection of re-interpretations of the band’s earlier works given a fresh spin with new lyrics by Stainthorpe and contributions from French opera singer Lucie Roche. Staying with the theme of classic tales, I asked Mr. Stainthorpe about his well documented interest in the romantic poets like Shelley and if their tales of beauty and tragedy still inspired him today “No because I loved literature when I was younger and our early albums were inspired by literary greats but I realised after a while that if you are only reading this sort of literature you’re missing out on other things that can inspire you. Movies, T.V., my own experiences were used. I found my own ideas and identity rather than just delving into the usual suspects. I’m enjoying being inspired by looking out of the window on a winter’s night with a glass of wine. I live in a hundred year old house, we only have a small garden but in winter it looks fantastic as it’s totally overgrown and I love the poetry but now inspiration can come literally from anywhere.